Until I set the April Bloggers Scream for Ice Cream challenge, I’d never heard of spoom. But as I checked the definitions for sorbet, granita and shaved ice, I saw a mention of spoom and followed the link to spoom’s own wiki page. I learned that spoom is a frothy sorbet, once very popular in England. 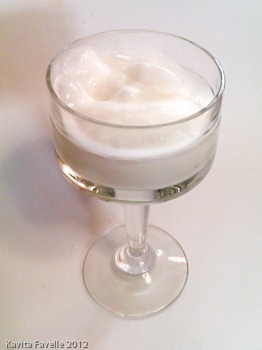 Like sorbet, it is made from fruit juice, wine, sherry or port. 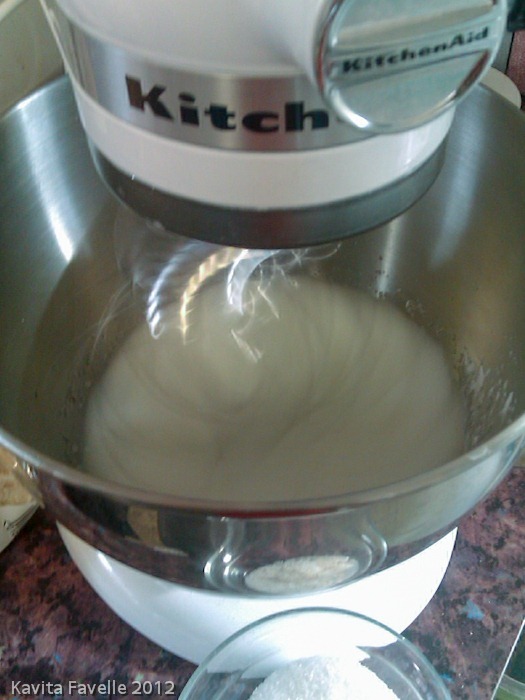 As the mixture begins to set, it is mixed with Italian meringue. It is served in a tall glass, often with a little champagne spooned over the top. The name comes from the Italian spuma (foam). Of course, I couldn’t resist! As I had some lemon juice in the freezer, I decided to make a lemon spoom. Because I left things later than I planned, once I had made my sorbet I popped it into the freezer overnight, and continued the recipe the following day. Of course, that meant the sorbet had frozen too hard to easily mix the meringue into it, so I left it out to thaw a little while, then used my Magimix food processor to give it a blitz, thinking its motor would easily handle this. I was wrong, the blade stuck in the sorbet, slipped off centre and shredded the spindle very badly. I suspect the cost of repair will be prohibitive. *cry* So do give yourself time to finish the whole process in one go. Both Pete and I really loved the result, essentially a lighter style of sorbet with an incredibly silky, smooth mouthfeel. We tasted the base sorbet before and after, and were impressed enough with the results that I’d definitely ‘spoomify‘ sorbets in the future. Note: As the egg whites are not cooked in this recipe, this may not be suitable for pregnant woman, or anyone with a weak immune system. You may wish to make an Italian meringue, cooking the egg white by adding sufficiently hot sugar or sugar syrup. Put the sugar and water into a pan on low heat until the sugar is fully dissolved. 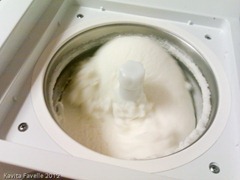 Once cool, churn the lemon syrup in an ice cream machine until it firms into sorbet. 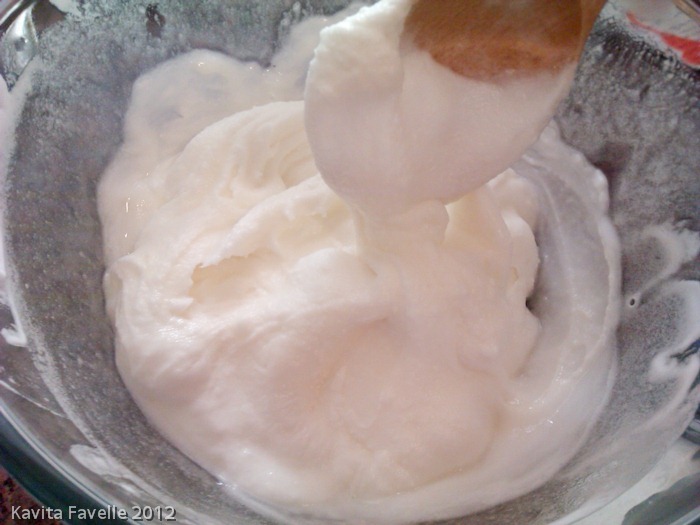 Beat the egg whites until frothy and add the cream of tartar. Increase the speed (if you’re using a mixer) and add the sugar gradually. Continue to beat the eggs until they form glossy, stiff peaks. Once the sorbet is finished churning, tip into a large mixing bowl, add a third of the meringue and beat together. This should loosen the sorbet. 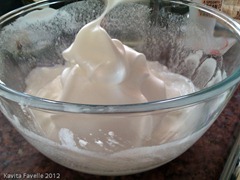 Now carefully fold in the remaining meringue and mix together very gently. Either serve immediately, in tall glasses (with or without a little sparkling white wine spooned over), or pour the soft mixture into a suitable container and freeze for one to two hours. 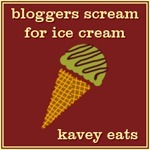 This is my entry for the April Bloggers Scream for Ice Cream challenge. 15 Comments to "Lemon Spoom: (Meringue-Softened Sorbet)"
I’m not sure I’ve ever had spoom but I really like the sound of it! Wow, this is really cool – I’ve never heard of it before! I’ll bet the texture would be awesome for parfaits and loads of other things, where the temperature contrast would give it a kick. Thanks for writing this! Yum – perfect on a Summers day. Kathryn, do try it, I’m really happy with it. We had some again last night, so it’s been in the freezer for few days, and it’s still retained that silkier mouthfeel. Fab! Melissa, you’re welcome, hope you enjoy! Laura, Pete ordered a new spindle, it arrived today so I guess we’ll find out whether it was just the spindle that was damaged or the drive shaft too. funnily enough I was talking to someone about spoom only the other day! great idea, sounds delicious. It’s definitely delicious, do have a go! I really wanted to experiment with spoom this month but I don’t think I’m going to have time this month 🙁 If I do, I’m definitely trying this though – looks yummy! Hope you have a go soon! I’m not sure why but the word “spoom” just makes me giggle every time. It sounds delicious though. Anything with a silky marshmallowy texture has to be good. I wonder why it has an Italian root to its name when it was popular in England. No idea, but agreed on the giggling! Have my egg whites from my Marans eggs in the fridge; can you freeze already whipped whites? Where can I buy the book SPOOM? 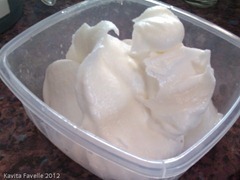 I’m not sure, Dolly, I’ve never come across egg whites frozen in whipped state… don’t they collapse as they defrost? Made you recipe using mint from the garden, rather than lemon, and it was a huge hit! I didn’t hear any negative comments from 15+ guests! How wonderful, I’m so glad you and your guests enjoyed the recipe!